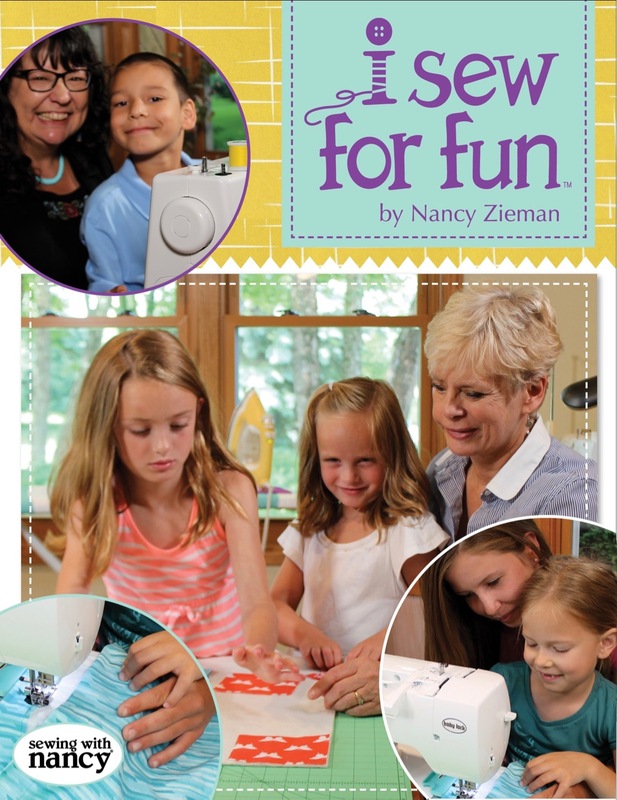 We’re honored to be included in the “I Sew For Fun” book launch blog tour! This new book is all about how to sew with the young people in your life, and it’s a wonderful addition to Nancy Zieman’s lasting sewing legacy. 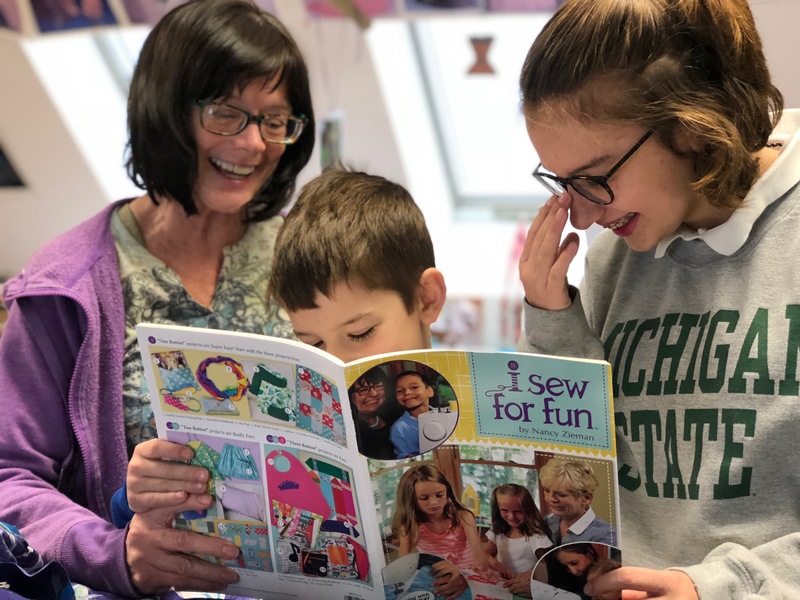 I’ve been a parent for 2.5 years- so I still consider myself a newbie- but Zede has been a parent for 37 years, and sewing much longer than that and we’ve both taught people young and old, related or not to sew. We’ve put together some advice for those of you who are hesitant about introducing sewing to the kids in your life. Kids are smarter than you think. 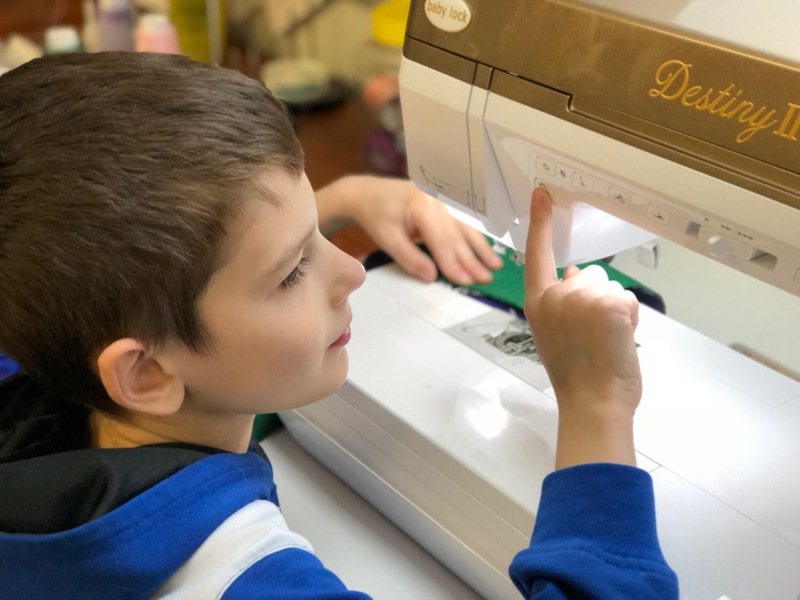 Looking at a skill you already have through the eyes of a child can be daunting, but you’re going to start at the beginning and go slow, just like anything else. 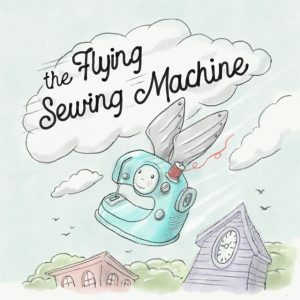 Plus, those of us who have taught both adults and children to sew can tell you that it’s really not all that different. When you show them a picture of what they’ll end up with, there’s a tangible pay off to work toward. 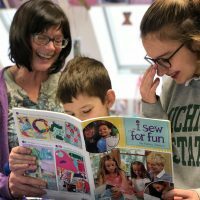 The “I Sew For Fun” book rates their projects from easy to hard with “buttons”- 1 button is an easy project and 3 button projects are more involved. Skills aren’t the only thing that go into sewing, there’s also time and attention span. More difficult projects might simply be larger and more time consuming rather than introducing a ton of new sewing skills. You’re worried they’ll hurt themselves, and rightly so! There’s lots of sharp things and moving parts. But most kids do have some sense of self-preservation, and don’t relish the thought of cutting themselves or pricking themselves with pins. 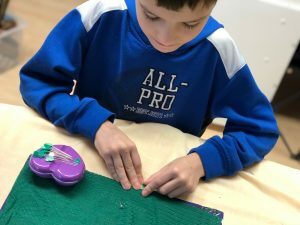 The Nancy’s Notions company has considered of these perils and offers a line of kid-friendly sewing supplies that includes a presser foot with finger guard and a magnetic pin cushion that makes it easy to pick up pins without pricking small fingers. In the first pages of the I Sew For Fun book, there’s a list of sewing tools for the “Little Partner” and sewing tools for the “Big Partner”. This is so wonderful to me. 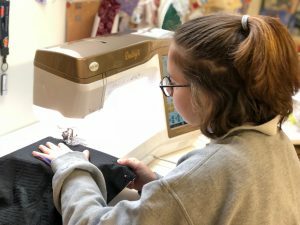 Kids need and love hands-on experience, but sewing isn’t something most people can do without some observation and instruction. Zede and I often talk about how much we love rotary cutters. 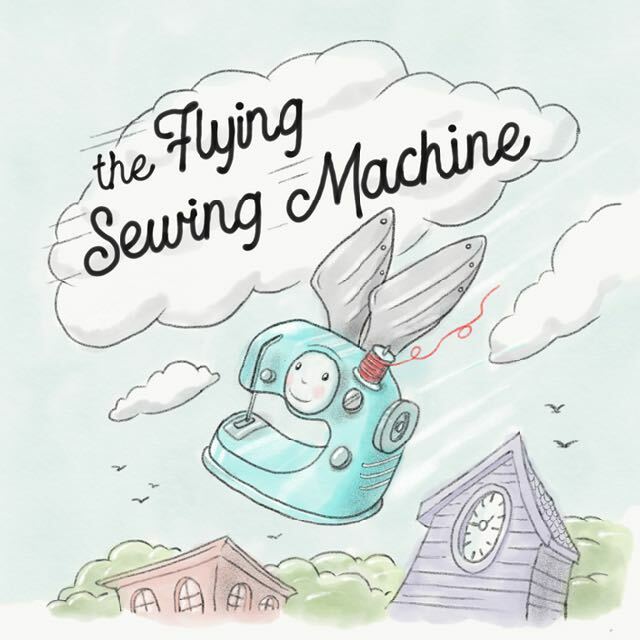 They are efficient, accurate, and easy to care for- but they are not appropriate for a child who’s never sewn before. The risk of getting cut is too great. 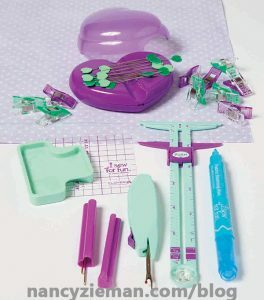 However, I’d highly encourage you to let your “little partner” see you using a rotary cutter and other advanced tools. That’s how they’ll learn proper technique and respect for the equipment. Each child will be ready for these advanced tools and techniques at a different time. 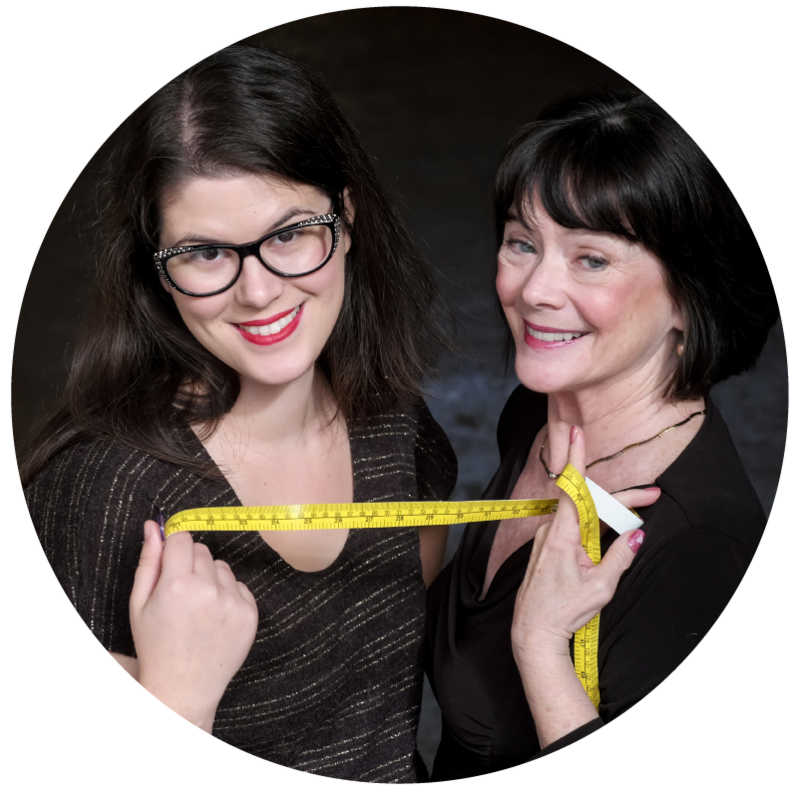 Watch your “little partner” and you’ll see when it’s time to try something new! We had a BLAST sewing with my niece Kathryn (12) and eldest nephew Elliott (8). 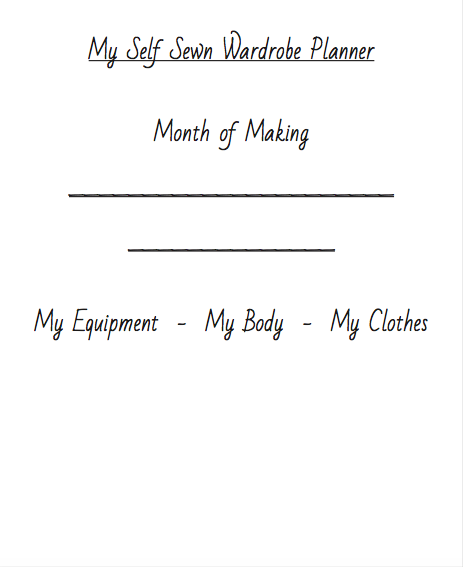 We made the drawstring backpack project from the I Sew For Fun book, and modified it a bit. Both kids are in dance, and we wanted to the bags to be ventilated, so their stinky shoes could get some air. instead of a woven fabric for the body of the bag, we used a knit mesh. If you’re an experienced stitcher, you’ll see that lots of the projects in the book can be slightly altered to fit different needs or interests of the kids in your life. 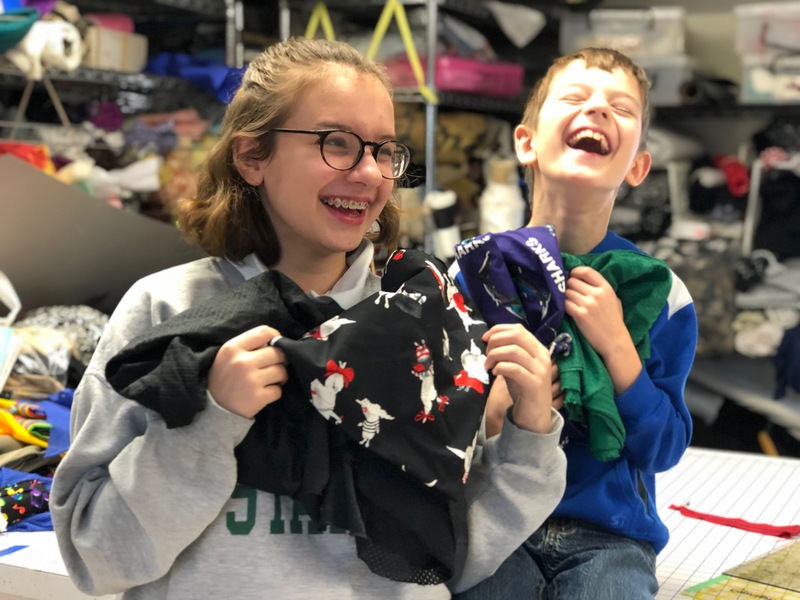 The kids did not like the fabric options we’d picked out for them (big surprise) and dug into the Fabric Library a bit further for an Olivia print (fabric library resident for 10 years) and a Shark print (fabric library resident for over 20 years). 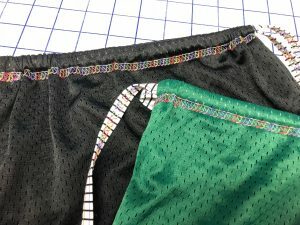 This was Elliott’s first time on a sewing machine (that was news to me), and he did an amazing job. I was happy to have the speed governor on our Baby Lock Destiny. Kathryn had sewn before, testing out decorative stitches on the Baby Lock Sofia, but hadn’t sewn many functional seams. Zede spiffed up the process by making the drawstrings with the Baby Lock Ovation belt loop binder. I told her I remembered loving to collaborate with her when I was younger, because she’d often add an element to our project that I hadn’t mastered yet, and it was very exciting for me! How sweet. My youngest is now 33 and an excellent seamstress and quilter who has taught her seven year old to see. I do sew but wish I had had more patience with her when she wanted to learn.